After the Juan de Fuca Trail in late August, I intentionally decided to continue training, but with reduced mileage. The goal was to give my body a break from some of the longer stuff, but at the same time, stay in shape so I would be ready to perform well at some of the upcoming shorter distance events. The reality was that my new teaching portfolio was demanding come September. I had little time to run, with the exception being the TNW and running with my school cross-country team. As a result of being stressed at work, my motivation to run was sucked away from me, and I struggled to maintain my fitness. To counteract this, I signed up for 3 upcoming races, thus putting the pressure on me to get in racing condition. By October, I was back into things with my speed, and I was ready to debut my new racing flats at the GoodLife Fitness 8k. I was poised for an 8k PB, but when the time came to race that weekend, I injured my back two days before and was forced to cheer Janelle from the sidelines. The injury wasn't bad though, and I was running again solidly by the following weekend. 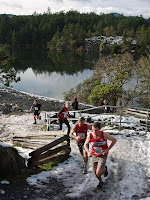 I decided to pass on other events in the fall like the Shawnigan 1/2 and the Jericho XC Challenge, and focus on the Thetis Lake 20k Solo Relay Run. Once again, I was in good shape but sickness that weekend would force me not to race...once again. Although I was frustrated by the lack of racing, I knew my training was solid, yet minimal, and I kept things going for much of November. In November, high school XC ended, giving me more focus and time for myself to really concentrate on the upcoming Gunner Shaw 10k race. Good news. This time I wasn't injured, I wasn't sick, and I was ready to race. I arrived to the race in good time, and was definitely exited to get my competitive vibe back in me. Having not raced this event before, I didn't know exactly what to expect in terms of the conditions and the course, but I could imagine what was out there. 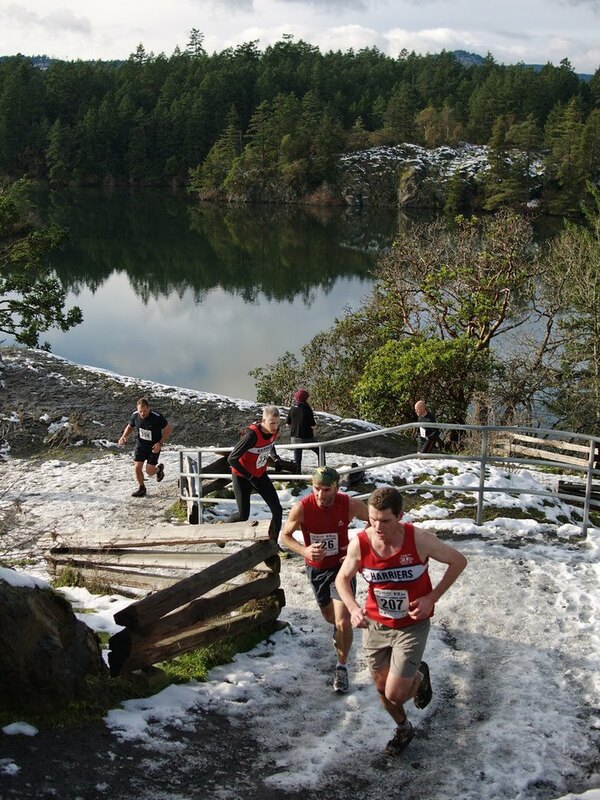 This race is notorious for mud and wetness, but this year, it was the packed snow and ice that caused concern from the runners. We received about 15 cms. of snow a week prior, and the trail had a pretty good pack on it. After a good warm-up, I decided at the last minute to go with my YakTrax to race. I had seen Shane Ruljancich wearing his, so I thought I'd be in good company. With 15 minutes to go before race time, I tempoed back to my car and switched shoes. I arrived back just in time for the start of the race, but my heart rate was elevated somewhat from this last minute decision. The race began and I attempted to not start too fast. I felt like I did this, and was happy with the start. The shoes seemed to be not too bad on the early paved portion of the race, and when I hit the muddy/icy trails I was very happy with my decision. I was extremely surprised to see just how fast everyone was around me. I thought that I would be much faster on the trails than the people around me, but the reality was that I was working hard just to maintain my standing. I was in a nice group of runners (including some of my training group), but as soon as the big uphills came, I really had trouble getting up them. This was atypical for me, and I was slowly being dropped my the pack around me. Gary Duncan surged ahead, as did Irvin Tang, and finally Chris Callendar. I was fine with this, hoping that my second-wind would kick in, and hoping that my shoe decision would give me some kind of advantage out there. My pace did not pick up however, and a few other people passed me as we made our way to the final hills. As I approached the final set of hills, I struggled to complete them, but was relieved to see I did not get passed by a couple of runners on my tail. However right at the top of the hill, I was passed by Mark Ritchie, and as the finish line approached, it looked like I was destined to finish right behind him. However, I felt a finishing kick inside my bones, so I decided to kick it along the beach/water and I did well to pass him. My time was 40:35...good enough for 37th Place overall. I was pleased with my overall effort, but was not really pleased to be destroyed my my training group (when I had beaten them all consistently in training). However, it was my first race in ~4 months, so in that regard, it was good to get one under my belt. My decision to wear the YakTrax was a stupid one. I was tired at the start line in my haste to get them on, and looking down at the finish, I only had 1 YakTrax on...and it had slipped. So really, I was running this race in a really old pair of trail shoes with little traction, and the course was on mud/ice. Hopefully next time, I would live up - a little more - to my potential.